Lake Tahoe Views | 3 Level Home w/ Private Hot Tub, Pool Table, Heated Driveway! 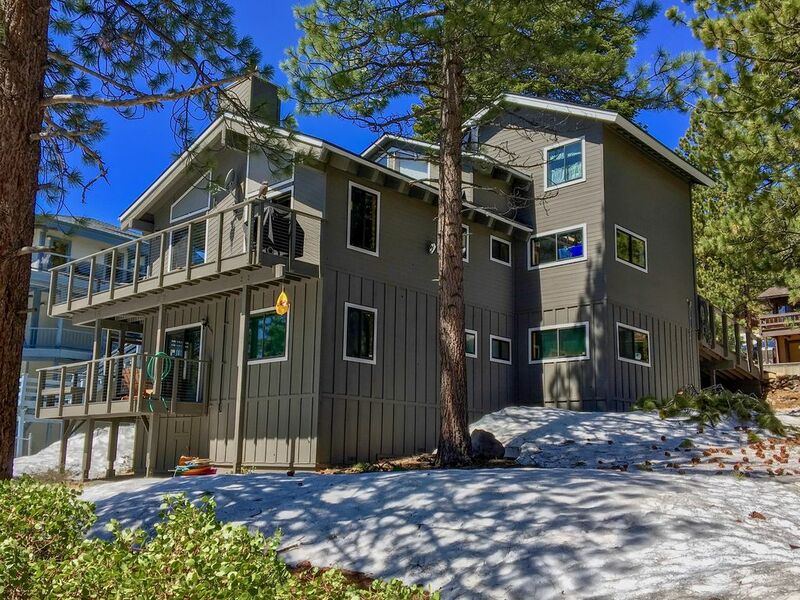 This is a updated 3 level private mountain home with views of beautiful Lake Tahoe, which is only 2.5 miles away. I've added a POOL TABLE, a PRIVATE HOT TUB, 2 more smart TVs (4 total), a pack n' play crib and portable high chair, and a third video game console with games (I now have Playstation3, Xbox 360, and Nintendo Wii). 2300 square feet of interior space makes it roomy. The paver driveway and asphalt approach are automatically heated in winter! No hassles with shovels, salt, or waiting for a snow removal service to make the rounds. HINT: Click on the pictures to enlarge them and show written explanations of what's shown in the pictures. This is a very charming freestanding private home in a private cul-de-sac on a forested mountain slope. You are surrounded by nature! Potty trained dogs may be approved. Dog fees are $15 per dog per night and dog rules apply. Enjoy the outdoor decks on all 3 floors. Barbecue on the Weber propane grill and in summer you can dine out on the massive middle floor wraparound deck. Enjoy the PRIVATE HOT TUB on the bottom floor deck (under the cover of the middle floor deck) - the hot tub is an awesome place to be when it snows! Awesome summer amenities too - Includes access to Incline Village's two private beaches for a small daily fee. $14 for adults and $5 for kids 6-18. Kids 5 and under are free! Between mid September and mid May, the beach kiosks are not staffed but you may still visit the beaches for free. The house sleeps up to 10 in 7 beds and offers tons of fun for the whole family. We have the most beautiful surroundings in the world outdoors and a self contained vacation here at the house if you decide to stay in. Shoot some pool in the game room. The house has Charter HD cable TV service for all four TVs, and high speed cable internet with WIFI (60-100+ Mbps speed). Use my Netflix or Amazon prime service for free streaming high definition movies to any of the four TVs in the house. The middle floor living area offers mountain living with nature! The entry is to the middle floor - the main living area "great room" plus a kitchen featuring granite counters and all the amenities for preparing gourmet meals. New range and refrigerator added Winter 2017. The adjacent great room has a hardwood floor and a dining area that can seat eight (9 is tight but possible), a lovely stone hearth with a gas stove with a remote (a cozy fire at the push of a button with no need to carry wood), a living area with a huge sectional couch and matching overstuffed chair and a home theater featuring a 55 inch Visio LCD High Definition TV, Stereo with a surround sound speaker system, Playstation 3 gaming system that also plays DVDs (with Move controllers and lots of games). There is a half bathroom on this middle floor and access to the garage. The interior is decorated with a "Tahoe Lodge" theme that is very charming. The middle floor has a massive wraparound deck for dining outdoors in summer, lounging, sunbathing, stargazing, and enjoying the beautiful views. The deck has a picnic table and patio furniture in summer, and a Weber propane grill that can be used year round. There are some filtered views of Lake Tahoe (through the pines) from the middle floor great room and deck. This is not a rustic vacation rental, this is a luxurious functioning home with all the amenities. Your host Trevor used to live here full time and has made the home very comfortable. The bottom floor features two bedrooms, one with a California king bed, a 43" TV, and its own private deck with the private hot tub and a tiny peek of Lake Tahoe through the trees, the other bottom floor bedroom has a lodgepole queen bed and twin over twin bunk bed. There are some kids books and toys too, but this room is also fine for adults of course. There is a full bathroom on this floor and a separate laundry room with washer and dryer, ironing board, and iron. The bottom floor also has a huge (approximately 20' x 20') extra bedroom/game room with two twin beds (one rolls under the other to make more space) and a couch that can be laid flat to sleep on (not counted as a bed). This is the 4th "bedroom" - it has a armoire for your hanging clothes rather than a closet and a dresser. This large room also has a POOL TABLE, a large L shaped desk to work at, new stereo (bluetooth connection to your phones for music), new 55 inch Roku 4K TV and Charter Spectrum Cable TV service, Xbox 360, and Nintendo Wii. Games provided. The top floor master suite has amazing views of Lake Tahoe! The huge master suite occupies the entire third floor and is very private, with a huge bedroom with queen bed, private deck, step down to a side room gym which is now equipped with a quality treadmill and recumbent lifecycle exercise bike, full bathroom with jetted jacuzzi tub, separate his and hers vanity, and walk in closet. Enjoy Charter Spectrum or streaming movies on the 43" Roku TV. The best views of Lake Tahoe can be enjoyed from the entry of this room from the top of the stairs since it sits above most of the treetops. 1) New Azek (Trex type but better) decking with invisible fasteners. No warping wood, no splinters or nail heads, it is gorgeous and totally smooth! 2) New taller balcony rails with nearly invisible cables between the posts to let the stunning views through. 3) Whole house Generac automatic natural gas powered emergency generator. Power outages do happen in Incline Village but you probably won't even notice because the generator will automatically prevent any power interruption. 4) The driveway and asphalt approach are automatically heated so they stay dry and safe in Winter with no shoveling or salt. It's much better than a snow removal service, because they don't clear all the snow and have to make the rounds to other homes. This was once my home, I still visit often, and I want my guests to feel at home - which means that you will find a lot more than the usual vacation rental basic supplies. Feel free to use whatever condiments, spices, and sundries that have been left by other guests. No smoking indoors. Designated smoking area just outside the game room. This is a gorgeous house in an idyllic natural setting at the #1 destination in the USA and you will make wonderful and lasting memories here! More world class ski resorts are clustered around Lake Tahoe than anywhere in the world. The winter of 2019 brought so much snow that some resorts will be open through the 4th of July (Squaw Valley - Alpine Meadows). If you ski or snowboard - be sure to visit Diamond Peak in Incline Village - only 3.6 miles from this house. It offers the best views of Lake Tahoe from any ski resort and among its lifts is a high speed quad chair that whisks you to the top in about 6 minutes. The daily lift tickets are also about 40-45% less than you will pay at Northstar Heavenly Valley, Squaw Valley, Northstar Resort, etc. See my facebook business page for tahoelodgingonline for spectacular photos - please like us. Mount Rose Ski Tahoe is 9.4 miles away on the way to Reno and is often great for Spring Skiing because it's elevation is very high. Northstar Resort is 14.1 miles away toward Truckee and in addition to great skiing they offer Ice Skating and lots of nice restaurants in their village. Alpine Meadows and Squaw Valley, site of the winter Olympic Games, are 23 miles away. Childcare services are available 24/7 at a facility in a home in Incline Village. Google Daisy Day Care Incline Village. Incline Village is home to some of the wealthiest people in the world, and no wonder. It is an pristine natural alpine paradise located on the North Shore of Lake Tahoe, the most beautiful place in the world. The elevation at Lake Tahoe is about 6,200 feet, this house is at about 7,000 feet, and the surrounding mountain peaks exceed 10,000 feet, which makes for abundant snow, skiing and all winter sports in winter, and mild temperatures averaging in the low eighties in summer. RENO (AP) — Lake Tahoe ranks first in the nation among choice vacation destinations newly ranked by a major travel website. The independent worldwide travel source put Lake Tahoe atop the list of its first Choice Destinations Awards, based on the opinions of millions of travelers. Lake Tahoe is the largest alpine lake in North American and is approximately 22 miles long and 10 miles wide and is over a thousand feet deep. It contains more than 30 trillion gallons of water - enough fresh, crystal clear water to cover the state of California to shin depth. There are more gallons of water in Lake Tahoe than dollars in the national debt. Only Incline Beach homeowners and our houseguests are allowed access to our 2 pristine beaches, each of which has a bar and grill. You can launch boats at the ramp at Ski Beach which gets much less traffic than public Sand Harbor. You can rent Stand Up Paddle boards at Burnt Cedar Beach and see the bottom until it is about 80 feet deep! My name is Trevor Alt and I am a 50 year old fireman, married with 4 teenage children. I practiced law in California for 10 years and still hold an inactive membership to the California Bar, but I have made my living as a firefighter for the Reno Fire Department for 15 years, a second career that I love. I am a fitness and health nut and I exercise religiously. The better to drag you out of a burning building with, my dear. I enjoy water and snow skiing and cycling, and have completed an xterrra sprint triathlon, a half marathon, and the Chico Wildflower Century bike ride. This home has been in my family since 1985. I purchased it from my parents in 2007, lived in the home until 2011, and will move back in with my wife when our children are all in college. We now live an hour away in Sparks, Nevada. I check on the home between guest stays and pride myself on my responsiveness to my guests. Please see my reviews. North Lake Tahoe is the most beautiful place in the world. I love to cycle, hike, and play golf, all of which are world class here. A very challenging bike ride is from my house to the pass on the Mount Rose Highway on the way to Reno, which is about 9,500 feet elevation. I've hit 45 m.p.h. on the way back down and enjoyed breaktaking views of Lake Tahoe. A 12 mile round trip hike I did with my wife in summer starts at that pass and goes to the summit of Mount Rose. Amazing hike. 3 times I have ridden my road bike 72 miles around Lake Tahoe which is America's most beautiful ride. The Flume Trail is rated one of the top 5 mountain bike rides in the world and ends (or begins) in Incline Village at the old Ponderosa Ranch (where the TV series "Bonanza" was filmed), about 5 miles from my house. Google "Flume Trail Bike Mountain Bikes". I also suggest the challenging hike from Spooner State Park to Marlette Lake, we enjoyed that one a few summers ago. Google it and pack a lunch. Even cozy Incline Village sees its share of tourist traffic in summer, but this home is about a mile away from the center of town. This house is on a quiet cul-de-sac on a forested slope looking down over the lake. Lake Tahoe is my favorite place to visit any time of the year. I commuted to work at the Reno firehouses from this home for years and every day when I first see Lake Tahoe from the Mount Rose Highway it always takes my breath away. Some years ago in early June I drove from Reno and saw people sledding in the snow that lingered just off the Mount Rose Highway and the same afternoon I swam in Lake Tahoe and the pool at Burnt Cedar Beach, one of Incline Village's private beach facilities. At the time I first moved here in 2001, I was an avid golfer with a single digit handicap index. I love Incline Village's golf courses which are Robert Trent Jones designs. When I had my driver working for me, I could hit balls over the netting at the back of the range. I take a moment each day I spend here to enjoy the gorgeous views of Lake Tahoe from the entry to the master bedroom. I love Incline Village's Championship golf course, nearby snow skiing, boating and wakeboarding, and Incline Village's private beaches. There are more worthwhile outdoor activities to do in this area than I'll be able to do in my lifetime. The location is serene and the natural beauty of the surroundings is awe inspiring. I love sitting out on the deck at night stargazing. Thousands of stars are visible due to the elevation and lack of city lights. I've made it so there's plenty to do if you just want to hang around the house and relax. Pool Table! There are 4 flat screen HDTVs with Cable TV in HD, Netflix, and Amazon Prime. Sony Playstation 3, Nintendo Wii, and Xbox 360 are great fun - I have all 3! I also have board games and love to read, so you will find at least a hundred books. I now have a heated paver driveway and approach that will automatically melt snow from the garage to the street, an automatic whole house generator (no power losses in storms), and a gas fired stove with a remote control has replaced the unreliable pellet stove. New decks and rails too! The Hyatt Regency Lake Tahoe Resort Casino is only 3 miles away. Lake Tahoe is a year round destination. The hot tub feels great after playing in the snow. In summer when it may reach 100 degrees F in Reno/Sparks, where I live and work, I can drive up to this house and it will be in the low to mid 80s. My favorite beach in the world is Incline Village's Burnt Cedar Beach, which has a lifeguarded swimming area and a lakeside lifeguarded Olympic size pool. Both beaches are closed to the public but you get access as my guest for a small daily fee - $12 for adults, $5 for kids 6-17, kids 5 and under free. Golf doesn't get more fun that it is at Lake Tahoe. The ball flies a club farther and curves less because the air is thinner at 7,000 feet up. Hit it long and straight! toilet, combination tub/shower, jetted tub, Master bath has a combination jetted tub / shower + toilet. toilet, The middle floor half bath has a toilet, sink, and vanity. The middle floor has a half bathroom with toilet and vanity sink with mirror. The top floor master suite bathroom has a toilet and combination jetted tub/shower with a separate vanity with double sinks and mirror. The bottom floor bathroom has a toilet and combination tub/shower with a separate vanity with double sinks and mirror. Nature surrounds you. Jeffrey pines, mountains with snow in winter for all winter sports. Sleds provided. Diamond Peak Ski Resort is 3.6 miles away. Northstar and Mount Rose are very close. Incline Village is home to some of the wealthiest people in the world, and no wonder. It is an alpine lake paradise located on the North Shore of Lake Tahoe, the most beautiful place in the world. Lake View : Unobstructed views of Lake Tahoe from top floor deck and windows, filtered through trees lake views from middle floor deck and windows, peek of the lake from the bottom floor hot tub deck. Unobstructed views of Lake Tahoe from top floor deck and windows, filtered through trees lake views from middle floor deck and windows, a peek of the lake from the bottom floor deck, hot tub, and windows. Nature surrounds you. Huge Jeffrey Pines. In October 2016 $45,000 went to replace the rails and decks. New taller rails have cables between the posts which lets more view through. "Trex" decking. Lake Tahoe! It's the most beautiful place in the world. Gas burning boiler with thermostats on each floor. Can be supplemented with the gas oven (which has a remote control and thermostat, makes a cozy fire at the push of a button) and 3 space heaters. Plenty of extra linens and bath towels. In addition to the washer and dryer, the laundry room is also equipped with a iron and ironing board. It's a Speed Queen. Speed Queen offers the longest warranty in the business becuase their dryers are workhorses that last. Gas oven with remote provides a cozy fire at the push of a button. No wood to carry or ashes to clean. 1 vehicle in the garage, 1-2 can be parked in the heated driveway and asphalt approach. 1 more parking spot on the property, adjacent to the public road. Street parking when snowplows aren't active. Parking for 1 vehicle in the garage. I provide a garage door remote opener for guests to use. The other bay provides storage for toys and my snowblower. Charter cable high speed internet is with broadband with WIFI. Plenty of towels for the house. No beach towels provided. Please bring your own beach towels in summertime. Gym quality treadmill and recumbent lifecycle in the side room off the master suite (gym equipment not shown in pictures). 60-100 Meg. charter cable broadband service with WIFI. Two home theaters, one on the middle floor, and one on the bottom floor. 55 inch Visio LCD HDTV and 50 inch Samsung DLP. The sectional couch on the middle floor is very comfortable. Newer side by side refrigerator/freezer with ice and water dispenser. No need to bring bottled water, the water out of the tap here tastes better, is cleaner, and avoids waste. Google "Tahoe Tap". New electric range installed Winter 2017. Help yourself to spices and condiments that have been left by previous guests. Please check expiration date. More than you'd expect. I drew from my experience renting a few homes that didn't stock far beyond the minimums. Full kitchen featuring granite counters, and all the appliances and amenities for preparing gourmet meals. Dining table has leaves that fold out to seat at least 8 people at a round table (10 is possible/tight) or you can fold leaves in to create a square table for 4 people. I have a portable high chair. 4 flatscreen TVs, all which are connected to cable. You can stream movies and other internet content on all 4 TVs. I provide Netflix and Amazon Prime accounts for your use. Charter cable service on the two large flatscreen HDTVs (55 inch Visio LED and 50 inch Samsung DLP). 2 Home theater stereos. The new amplifier in the game room connects to phones and other bluetooth devices to play your music through my stereo speakers. Playstation 3 and Xbox 360 play blue ray DVDs and standard DVDs. Lots of paperback novels. At least a hundred. Large 4th sleeping room / office / gym / extra downstairs with home theater with Nintendo Wii and Xbox 360. Playstation 3 is at the middle floor home theater. Board games in addition to video games. I've got some CD's at the house. I grew up on rock and roll. You can play them on the Playstation 4 and Xbox 360. Stereo speakers are connected. A bar sized pool table (some shots are restricted by a wall and a support column but I provide a "shorty" cue). Some stuffed animals and kids books and DVDs. The Playstation 4 and Xbox 360 play DVDs on the 2 entertainment centers in the living areas. DVDs on the middle floor. Kid's DVDs on the bottom floor. Playstation 3, Xbox 360, and and Nintendo Wii games are provided. All 3 floors have balcony decks. Inflatable kayak. On garage storage rack. If the tires are intact you may borrow my oldie but goodie Specialized hard rock mountain bike. No suspension, it's old school. In summer, there may be kayaks and stand up paddle boards for rent at Burnt Cedar Beach. All 3 floors have balcony decks. They are "maintenance free" Azek (like Trex) so there are no nail heads. The rails are a cable system with sturdy wooden posts - very safe yet let views through. Sand toys and a few beach chairs and a beach umbrella are normally kept in the garage. Diamond Peak is only 3.5 miles away and has good prices and panoramic lake views. Mount Rose is 15 minutes away. Northstar is about 30 minutes away. Squaw Valley or Heavenly Valley 60 minutes. The tennis center by the Incline Village Recreation Center rents courts. The 2 local Incline Village Golf Courses are gorgeous and the ball flies a club further in the thinner mountain air. Must play. Lots of other great courses are in the area between 20-60 minutes. (2) - Incline Village has an Olympic size lifeguarded pool right next to Lake Tahoe at Burnt Cedar Beach on Lakeshore Blvd. Also, an Olympic size indoor pool at the Incline Village Recreation Center. Private bullfrog hot tub on the bottom floor deck, accessed by a slider off the bedroom. It's outdoors but the middle floor deck is above the hot tub - VERY COOL SPOT if it snows but isn't too windy. Close to Casino gaming, golf on 2 local courses, frisbee golf, spa, skateboard park, bike park, snowmobile rental, kayak rental, stand up paddle board rental, bowling, Shakesphere festival at Sand Harbor, Wooden boat event, America's most beautiful ride, tough mudder, xterra triatholon, boating, water and snow skiing, Flume Trail (rated one of the top 5 mountain bike rides in the world). Access to Incline Village's 2 private beaches (Burnt Cedar Beach and Ski Beach aka Incline Beach) for a daily fee ($14 adults, $5 children 6-18, 5 and under FREE). In and out privileges. If you snow ski - be sure to visit Diamond Peak in Incline Village - only 3 miles from my home. It offers the best views of Lake Tahoe from any ski resort and has a high speed quad chair that whisks you to the top in 7 minutes. Like most homes in Incline Village, this home does not have central air conditioning (summer highs average 82 F). There are 4 ceiling fans + a box fan. Pool table! Private hot tub! We had such a wonderful time. What a great place to spend ski trip with families. Ample amount of space for kids to occupy themselves. Great game room with pool table, Hot tub to soak in after day of skiing, TVs in each room to wind down before snoozing, etc. Trevor is a wonderful host for the place. He didn't mind me asking him questions and he responded promptly. We would love to book again for another ski trip or in summer. Overall this was the best lodge I have booked so far in Tahoe! Thank you for the kind review. I look forward to having you back! We had a great stay at Trevor's in Incline Village. Trevor was very responsive and quick to let us know to call him for anything. The downstairs game room was a huge hit with my teen son and his buddy. With video games and the pool table in the room we never saw them! Kitchen was perfect and beds were cozy. The house is very clean and well taken care of. We will definitely be coming back to Trevor's house in the future. Thank you Trevor for your hospitality. With a pool table and 3 gaming consoles, it's a blast for teenagers and anybody who wants to play! The property was the perfect size for my family. The futurnirure was a bit dated and the beds were not comfortable. I could only find bath size towels and the housekeeper does not do a great job cleaning. The location was great and there was plenty of room to enjoy the snow without traveling. Great times!!! Awesome large comfortable house with many beds! Things that I really appreciated were Hot tub, close to skiing, beautiful location with nearby hikes, game room!!! Will come back! House is well-positioned above Incline Village in a quiet cul-de-sac. We stayed a week and had no issues. In fact, a one point, the entire neighborhood was blacked out due to a snow storm, but, because the house has a generator, we were one of the only houses with power. Well-furnished house with everything you need provided. Trevor gives great written instructions and suggestions and has little, helpful labels on the trash and other places to remind you what needs to be done. We intend returning in 2019. Trevor let us have 3 dogs in the property, which we really appreciated. Thank you for the kind review. I will look forward to having you back! The automatic whole house generator is worth it's weight in gold when we have a power outage. It's powerful enough to run everything in the house, including the hot tub and the automatically heated driveway. These upgrades are one of the ways I seek to set the vacation experiences I provide apart from other alternatives. Beautiful and well appointed home! Spent a full week at this beautiful home in a very nice Incline Village neighborhood. It is a very comfortable and well appointed place to stay. The floor plan is great. The bedrooms are layed out terrifically for privacy and the beds are very comfortable. The new decks are beautiful. Trevor provides you with great details on using everything this home has to offer and ensures your stay is the best. He is a wonderful host! Great house, location and host! What more could you ask for! Thanks Trevor! Thank you for the kind review. I'm proud of the wonderful vacation experiences I provide for my guests. Lake Tahoe: #1 most popular destination in the USA. Blessed with sparkling natural beauty, Lake Tahoe is considered the jewel of the High Sierra. The lake is known for the clarity of its water and the panorama of surrounding mountains on all sides. At 6,229 feet above sea level, Lake Tahoe is the highest lake of its size in the United States, measuring 22 miles long by 12 miles wide, has a surface area of 191 square miles and an average depth of 989 feet and 72 miles of shoreline. Incline Village has a population of approximately 8,000 and is surrounded by Forest Service land. It is a quiet affluent community with a number of great restaurants, a small movie theater, 2 world class golf courses, a bowling alley, quaint shops, and warm hospitality. The Lone Eagle Grill at the Hyatt Regency Lake Tahoe miles away -a superb lakeside restaurant with an outdoor firepit that is an idyllic place to enjoy a cocktail and appetizers. There is also a pier with a bar that serves tasty food and drinks in the summer. The Hyatt casino is 2.9 miles away. 3 More casinos within 5 miles at the California/Nevada border. Next to the Hyatt is Ski Beach/Incline Beach which is restricted to Incline Village residents and our guests (such as you). There are lifeguards, sand volleyball, barbecues, a snack bar that serves burgers, sandwiches, drinks, etc., a jungle gym, and a boat ramp. There is a small daily fee. For 2018 it is $14 for adults, $5 for children 6-17, Kids 5 and under FREE (the daily fee also covers Burnt Cedar beach with in and out privileges for all private beaches). 3 miles away is Incline Village's other private beach that you also have access to: Burnt Cedar Beach. It is my favorite place in the world. Burnt Cedar Beach has all the amenities of Ski Beach but instead of a boat ramp it has an Olympic size lifeguarded pool, a kiddie pool, and a roped off lifeguarded swimming area of the beach, along with a concession for renting kayaks, stand up paddle boards, etc. Other Activities: Boating, volleyball, snowmobiling, sledding, bowling, private hot tub, golf, snow skiing, water skiing, tennis, hiking. Skiing: More world class ski resorts are clustered around Lake Tahoe than anywhere in the world. Diamond Peak Ski resort is only 3.6 miles from my house and offers breathtaking panoramic views of Lake Tahoe and reasonable prices. 2018 rates are $89 ($99 weekend) for an all day adult lift ticket as compared to $129+ at Squaw Valley and Heavenly Valley. At Diamond Peak Youths 13-23 are $69 ($79 weekend). Kids 7-12 are $39 ($44 weekend) and kids 6 or under ski for FREE. Save $5 per ticket for online purchases at Diamond Peak website. Multi day discounts and $5 discounts for online purchases are available. Check Costco for Diamond Peak specials too! Other ski resort driving distances: Northstar Resort 14.1 miles. Mount Rose 9.4 miles. Squaw Valley and Alpine Meadows: 23 miles. Heavenly 27.1 Miles. Great sledding, cross country skiing, snowshoeing, snowmobiling, etc. are within 10 minutes (the Meadow at Mount Rose right next to Hwy 431) and I have a toboggan, sleds, and saucers for your use. Rachel and I sledded down the hill right next to our house. We built snowmen and make snow angels in the yard. My parents left pairs of snowshoes at the house that you are welcome to try out and you can use my Sorrel boots. In winter, the driving range at the Championship Golf Course can be used for sledding. It's a shorter, less popular alternative to the Tahoe Meadows, which has much longer hills and access to a long steep hill if you're adventurous. In summer, theatergoers flock to see the Lake Tahoe Shakespeare Festival at nearby Sand Harbor. Google it! Golf: The Incline Village Mountain course is the best executive course anywhere. It is less than a mile from my house. The Incline Village Championship course is 2 miles away. This superlative golf course was one of the reasons I originally moved to Incline Village. Great driving range and short game practice green/bunker. Golf at the Championship course is especially fun. The ball flies at least a full club farther (and curves less if you slice) due to the "thinner" air at elevation. I have more power than finesse and have hit drives close to 400 yards and have made an eagle on the par 5 second hole with an 2 iron off the tee and a wedge into the green. The Old Brockway course is in Kings Beach, a ten minute drive from my house. It is a classic layout on mostly flat land near Lake Tahoe. There is a driving range. Edgewood Golf Course is a memorable golf experience - 45 minute drive to South Lake Tahoe. It hosts the Subaru Celebrity Golf tournament each summer in July. There are some newer upscale courses in the Truckee area, and the Northstar course is a nice track as well. The frisbee disc course by the Incline Village Recreation Center is fun, and I've got some discs and a satchel for them and you are welcome to try them out. You may check in or out any day of the week except Saturdays. The owner may approve exceptions to this rule in advance of bookings in Spring or Fall. Potty trained dogs may be approved for $15 per dog nightly fee and refundable damage deposit increased from $300 to $500. Please do not bring a dog that may damage this home or bark. No smoking indoors. There is a designated smoking area just outside the game room that isn't enclosed, but has the driveway above you. The house is not large enough to host more than 10 people and the housekeepers charge $50 more total for parties of 9 or 10. Thanks! If you choose instant booking and have a party larger than 8, owner will invoice you for the extra cleaning charges. They can't be waived, they don't go to the owner. There's an exterior camera recording everyone entering and leaving the home and remotely saving the recordings to the cloud - "sneaking" people or animals in forfeits the deposit and results in eviction. I encourage you to consider purchasing trip-cancellation insurance. Always carry chains if you don't have a 4 wheel drive vehicle with snow tires.